How Many Bird Toys Should My Parrot Have in His Bird Cage? Home | How Many Bird Toys Should My Parrot Have in His Bird Cage? There are many different opinions about this subject. A lot of bird owners will say "my bird doesn't like to play" or "my bird destroys his/her bird toys right away so I don't want to buy that many toys for him". 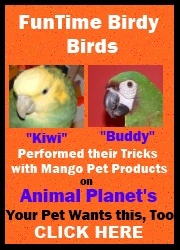 The truth of the matter is that birds need at least 10 to 14 toys in their cage at one time. The reason for so many toys is simple. Imagine for a moment that you were trapped in your house with nothing but some food, water and only one book to read. How fast would you finish that book? How bored would you be after you finished reading that one book? What would you do next? The answer is simple, nothing. Now look at it from your bird?s perspective. They have one or two bird toys in the cage and some food and water. After they play with the one or two toys, what can they do next? The answer is the same as for you, nothing. When I bought my first bird 25 years ago I did not know that she needed so many toys. I did the usual 3 to 5 bird toys at one time. What I noticed was that my Umbrella Cockatoo was bored. She would often scream for my attention. After researching about birds and bird toys, I realized I had not provided her with enough stimulation to make her a happy and healthy bird. I then started providing her with more and more toys and she became a more playful and happy bird. Now I am sure after reading this you are asking yourself, where am I going to put all these toys and how will my bird be able to move around in their cage with so many toys? The answer is simple you can place several bird toys along the back wall of the cage. You can also place the toys on the left or right side of the cage as well as hanging a few from the top of the cage. Remember to provide a perch near the area where the toys are so your bird can easily reach the toys. Another interesting spot to put some toys is hanging from the outside of the cage. Your bird can grab the toy from inside and this will become a whole new way to play for him. My mom actually does this a lot with her Cockatiel and he just loves to tug at the toy outside the cage and try to pull it into the cage. Remember that birds are a lot like kids. They get bored very easily and need a lot of stimulation. In the wild they would spend most of their days foraging and running from danger. In our homes they have nothing to do but sit in their cage. This is why it is essential to provide our beloved birds with as much stimulation in the form of bird toys as possible.